If you're a Banana pudding fan, then you are going to love this amazing delicious southern indulgence. 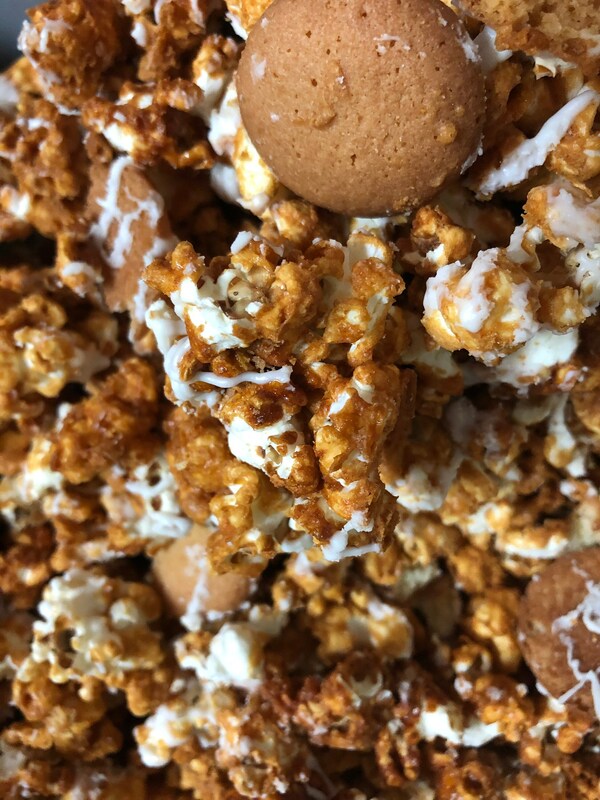 It Starts with fresh popped gourmet popcorn, add vanilla wafers, then a bath of made from scratch banana cream caramel, goes into the oven to be baked to make it a crispy sensation, then completed with a drizzle of white chocolate. Oh yea it takes a while to complete but the end results is so amazing, you'll be addicted after the first bag. Banana cream caramel, vanilla wafers and white chocolate what more could you ask for. Simply amazing treat. Perfect for birthday, college care package, party favors, or just because you love the good stuff. Comes in 2 sizes: Medium 4 oz (1/4 lbs.) bag or Large 8 oz (1/2 lbs) bag. Each bag is Heat sealed for freshness. We would love to include a message just mark as a gift and include your message. Thank you for shopping Nana's , we enjoy serving you. Follow us on Instagram @nanasgourmetgoodies or on facebook for discount codes.